When it comes to content marketing, these companies need no introduction. They’re not just great tools. HubSpot and Marketo are established resources to the marketing world. They’re successful companies, too. HubSpot rounded out 2017 on track to make $370 million in revenue. Marketo went private in summer 2017, bought for the humble price of approximately $1.79 billion. Both HubSpot and Marketo give a lot of blogging advice to marketers. But we wanted to see how HubSpot and Marketo actually do it—not just read how they say the rest of us should do it. One thing to keep in mind as we dig through these blogs: we’re not comparing apples to apples. This report is not going to show you who’s better at blogging. But it will give you a look at the similarities and differences between a world-class SMB marketing blog and a world-class enterprise marketing blog. Marketo’s marketing blog generates content for both B2B and B2C marketers. Their blog lists 28 categories, 16 of which are specific varieties of marketing (account-based, content, event, etc.). The others focus on responsibilities that generally fall to the marketing department (e.g., branding) or topics that marketers tend to work with other departments on (e.g., sales). Marketo takes a double-barreled approach to blog properties. While their marketing blog is full of practical tips for marketers at every level, the CMO blog focuses on the enterprise executive marketer. CMO Nation content is organized into three general buckets for the senior marketer: insightful articles, conversations with CMOs, and downloadable research and resources. This is one of the Internet’s most-visited marketing properties. The HubSpot blog is built around three general categories: marketing, sales, and customer success. The HubSpot blog is three blogs in one: each category runs like a blog of its own. HubSpot’s Medium publication on growth has a decent degree of overlap with HubSpot content. They have more than 150,000 followers, and a growing host of contributors weighing in on how companies can (and should) grow. 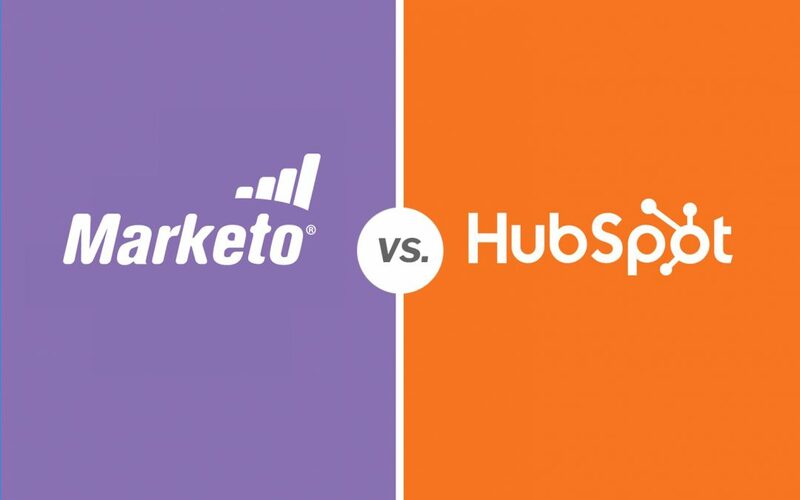 HubSpot vs. Marketo: who publishes more? 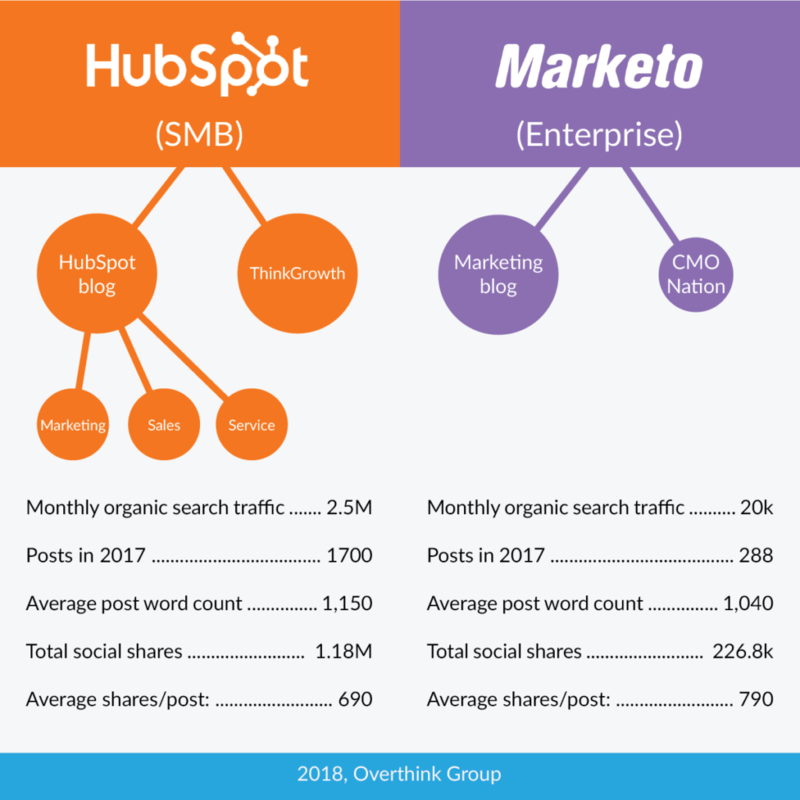 Between the HubSpot blog and ThinkGrowth, The Big Orange Sprocket published (or updated) about 1,710 blog posts in 2017—nearly six times the number of posts added to Marketo’s blogs. Here’s how that breaks down across each platform. Wait. How does HubSpot put out so much content? Remember, they’re running three blogs in one. They’re creating content for SMB marketers, salespeople, and customer service folks. Plus, they have a lot—and I mean a LOT—of contributors. HubSpot credits 437 unique contributors for the content published on their blog, with 57 authors at ThinkGrowth. This makes a lot of sense: HubSpot built a popular marketing blog. They also have a strong agency partnership program—which means they pull from a vast pool of marketers who would love to see their headshot on HubSpot’s blog. However, Marketo has a lot of writers, too. The Marketo blog credits 145 unique authors, and seven unique authors at CMO Nation. The answer: That’s not how these companies think about blogging, and neither should you. Both HubSpot and Marketo promote their blog content to specific segments of their audience. HubSpot cut their email frequency in North America in half by focusing on sending fewer, but more relevant emails. And Marketo’s software is specifically built to deliver the right messages to the right people. These companies are creating loads of content, but they’re not blasting each piece of content to their whole audience. Instead, each post has its own job to do (similar to what we found in our teardown of Casper’s content marketing). Word count numbers rounded to the nearest ten. But does word count affect readership? We’ll take a look at that later. 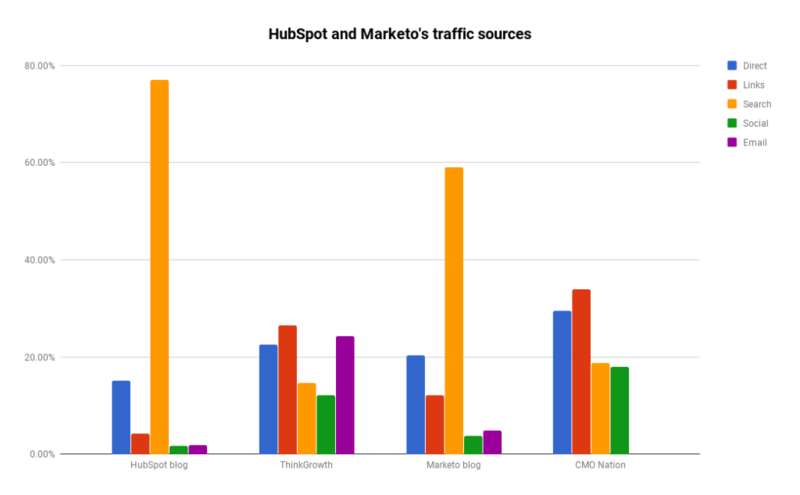 Where do HubSpot and Marketo get their blog traffic? According to SimilarWeb, both the HubSpot blog and the Marketo blog pull most of their traffic from organic search. Let’s take a closer look at what’s driving all that traffic from search engines. The HubSpot blog is an SEO juggernaut. According to Ahrefs, they get about 125x as much organic search traffic as Marketo. Of course, there are a lot more SMB marketers in the world than there are enterprise marketers. So it follows that the SMB blog would get a great deal more foot traffic. We pulled the data on each blog’s top 10 blog posts by organic search traffic. When you look at these lists side-by-side, the differences between SMB SEO and enterprise SEO become clear. The “%” columns refer the the percentage of the blog’s monthly organic traffic the corresponding post is responsible for. 8 2% How to Make a Chart or Graph in Excel [With Video Tutorial] 1% Are You a CMO or a VP of Marketing? These lists are so different, it’s hard to believe we’re even comparing them. We’re not comparing apples to apples—we’re comparing apples to apple-scented candles. HubSpot’s top organic blog content is deeply tactical. Look at all those tutorials and templates! Marketo, on the other hand, tends to stay in the quick tips zone, providing snackable nuggets for (presumably) fewer readers who are less entrenched in the tactics. They link the related blog posts to that page, and have that page link back to those related posts, creating a “cluster” of different posts around that topic. HubSpot completed the tedious process of reorganizing their massive, massive load of content in 2017. And they’ve seen a 107% increase in traffic to their resource pages since then. 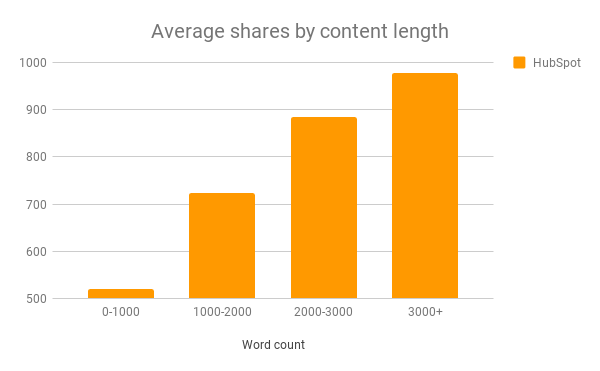 But the HubSpot blog is working to send more long-tail traffic to these pages, and the pillar pages send more general traffic to specific posts. With the kind of wins they experienced in 2017, it’s foolish to overlook this. Marketo has been doing this for a while now. They have long-form pages on their root domain defining and explaining concepts like content marketing, account-based marketing, and lead generation. The Marketo blog explores specific facets of these topics, and links back to the appropriate pillar pages. It seems to be working for Marketo. Their pillar pages rank #1 for “lead nurturing,” “mobile marketing,” and “event marketing”—just to name a few. Blogs reach people outside of search engines, too. We examined all four properties using BuzzSumo’s data to find out what kind of content is resonating with each audience. Welcome back, ThinkGrowth and CMO Nation! Again, no surprises here. HubSpot has the bigger audience. HubSpot publishes more content. HubSpot leverages more guest authors, who will push their content to their audiences. It all adds up to HubSpot’s content getting about 1.18 million shares in 2017. 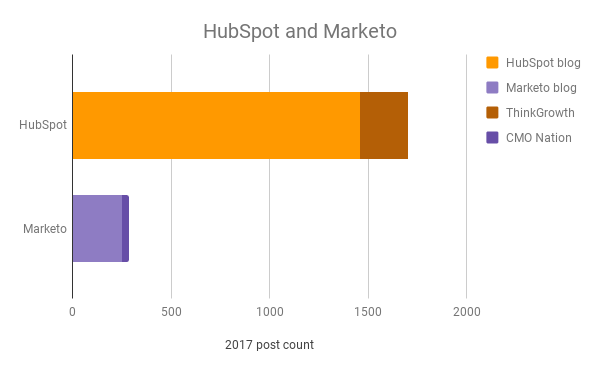 If we look at the average shares per post across these properties, we see that the average blog post on Marketo properties gets about a hundred more shares than the average post from HubSpot. Share numbers rounded to the nearest ten. Does word count affect shares? 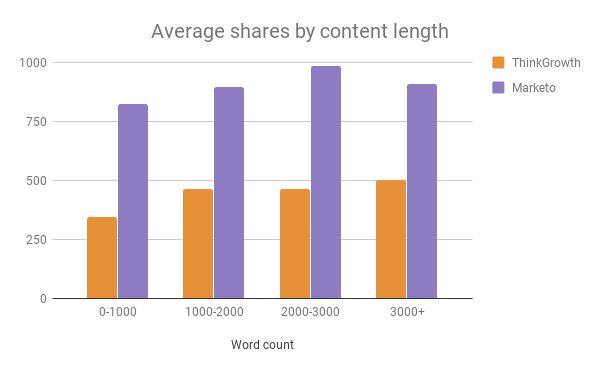 Marketo’s blog shares hold relatively steady no matter what the length. We see a similar story with ThinkGrowth, too. However, we’re only working with a few hundred posts on each of these properties. Generally speaking, the longer a post on the HubSpot blog is, the more shares it’ll get. Marketo and HubSpot aren’t just running blogs. If you’re an enterprise marketer, Marketo offers what feels like an endless supply of free, helpful resources to help you do your job. If you’re an SMB marketer, HubSpot has you covered—from writing a mission statement to creating a GIF in Photoshop. HubSpot’s blog is almost a tactical Wikipedia for the digital marketer. This doesn’t even touch on the ebooks, definitive guides, checklists, free tools, templates, etc. that both companies offer! Remember how HubSpot overhauled their blog architecture? It wasn’t easy for them. In fact, it was such a huge task that their team tabled the project for a year. But once they started arranging their content around high-level topics and intentionally linking their posts to pillar content, they more than doubled traffic to their resource pages. And like we saw earlier, Marketo has been doing some similar work with their blog for a long time—and they rank for some pretty sweet terms. Find the topics your audience wants to know about. Write a single authoritative piece (pillar page) of content about each topic. Blog about specific issues related to these topics. Link those posts back to the appropriate pillar pages. Link the pillar pages to those blog posts. Quality without quantity can only get you so far. Both HubSpot and Marketo have mastered the Producer methodology and pump out a great deal of content. This allows them to engage specific personas with content that helps them through each stage of the buying journey. Make sure your editorial team has a handle on the blog’s content strategy, as you’ll want someone on your team making sure blog posts are optimized for search engines, linked to the right pages on your site, and rigged up with imagery that’s on-brand for you. HubSpot has a blog post on how to do just about any task that a marketer will face. That’s good for them, because when you’re working with SMBs, the marketing leadership is likely to still have a role in the day-to-day marketing work. Case in point: I once worked for a software company that employed about 400 people. For a season, the VP of Marketing had to sign off on every new piece of copy and design before it went live. This is an example of an executive decision-maker who would still find value in tactical content (and would sometimes share that content with the department). If you want to reach the SMB market, blog in ways that help your personas do their jobs better. It’s good to have tactical content on your blog. But when you’re going after large-scale clients, you want to help the decision makers understand exactly how you can help them. That’s where writing high-level definitive content comes in handy. For example, your 4,000-word how-to guide on account-based marketing may have won the marketing director’s attention. But she needs to convince her CMO to convince 10 regional VPs of sales that your ABM platform is right for the organization. The problem? The CMO is really, really unfamiliar with ABM, and the marketing director doesn’t feel like she can explain it in a way that clicks. You can help her out by publishing content that helps the CMO understand this topic better. This allows him to win over the internal stakeholders. That means you get a new customer, the marketing director gets the solution she wants, and the CMO feels like he made a wise, informed decision. Everyone wins, because you wrote that high-level content. For years, HubSpot and Marketo have invested an enormous amount of time, money, and effort into their blogs. Today, they own much of the online conversation around marketing. If you want to blog well, you should pay attention to how they’re doing it. After all, if they can’t get this right, we’re all screwed.